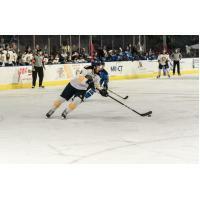 NORFOLK, VA - Domenic Alberga scored a goal and added two assists as the Norfolk Admirals topped the Jacksonville Icemen Saturday Night at Scope Arena. Alex Rodriguez netted his first professional goal for Norfolk. Cody Fowlie had the lone goal for Jacksonville. With the win, Norfolk sits only eight points back of the fourth and final playoff spot in the south Division. The Admirals jumped out front with a goal from Brandon Rumble. The Admirals were able to maintain a brief period of pressured zone time. Alberga skated from the right circle through the middle of the ice and into the left circle before firing off a back-door pass to Rumble who was waiting to redirect the pass past Ken Appleby to give Norfolk a 1-0 lead at 17:51 of the first period. Norfolk extended their lead with an incredible goal from Domenic Alberga. Alberga gathered the puck in front of the Norfolk blue-line after he forced a turnover in the Norfolk defensive zone. Alberga fired a slap-shot from in front of the Admirals blue line that bounced right in front of Appleby before going between his legs and into the net to give Norfolk a 2-0 lead. The Admirals extended their lead with the first professional goal for Alex Rodriguez. Rodriguez blocked an attempted dump-in at the red line, which led to a rush the other way for Norfolk. Rodriguez skated in on the right side, faked a slap-shot, and unleashed a wrist shot that beat Appleby glove side to give Norfolk a 3-0 lead at 14:53 of the second period. Jacksonville answered the Norfolk tally with a goal from Cody Fowlie. Dajon Mingo played the puck into the right circle for Everett Clark. Clark dropped a pass back for Fowlie who was able to shoot the puck just inside the left post past Ty Reichenbach to cut the Norfolk lead to 3-1 at 3:27 of the third period. Norfolk reclaimed it's three-goal lead with a short-handed goal from Jake Wood. Eric Roy played a pass from the Norfolk zone to the Jacksonville blue-line for Jake Wood. Wood skated in on the right side and fired a shot past the glove of Christian Frey to give Norfolk a 4-1 lead. The Admirals added two late goals, one even-strength and one on the power-play and went on to win by a 6-1 final score. Ty Reichenbach made 28 saves on 29 shots to win his 20thgame of the year, while Ken Appleby made 14 saves on 17 shots. Christian Frey made 6 saves on 9 shots for Jacksonville in relief of Appleby. The Admirals continue the homestand this Friday, March 22 at 7:00 p.m. against Jacksonville.